Often, when family members have cooked for celebrations, I've been fed well, but there hasn't been a dessert option. The host has often been apologised and said that they didn't know what to make. I know that it's not that difficult, but I realised that after I looked for recipes and tried them out; so I understand why they might feel unsure. I think that this post will break the myth without me needing to do anything but add the recipes! There are so many of them! There are quick ones and others which need a little more time, and most them don't need any out of the ordinary ingredients either! I will be adding to this post, so that you have a selection of recipes for vegan desserts and Mitthais to hand, in one place. I am super biased about this recipe, because these Penda remind me of when I was at University and my Dad used to get them sent to me in the post! Why? 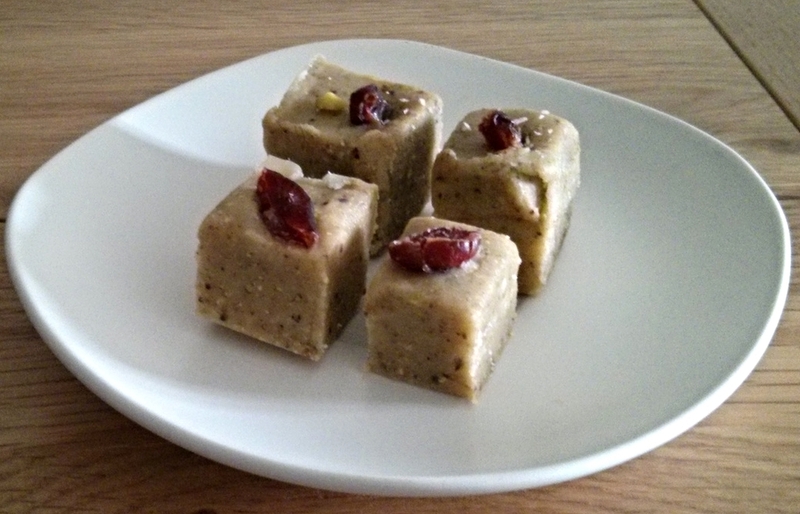 It was one of the few 'Indian' sweets that I enjoyed and this recipe replicated the taste of non-vegan Maava Na Penda for me. Delicious! This is quick and easy to make. You end up with healthy, moreish slices of dates that are infused with nuts and desiccated coconut. Yum! I haven't made this recipe yet but I got to taste the fruits of it! Many of us had more than one piece because it was so nice! It was soft and had a subtle flavour. This is another versatile recipe. You can flavour it with Pistacious or rose syrup. I enjoyed making and eating both of them as they create very different, yet delicious Barfis. They melt in your mouth and are very satisfying! Jigna used this recipe to make a very cool looking, and even better tasting, roll, which has subtle flavours, and is simply moreish! Sandip followed this recipe to make a Mitthai, which draws you in from the minute you look at it. Why? The colour is stunning! Beyond that, it is soft and sweet and you'll experience a variety of textures. These are created by the kind of, soft fudge effect plus the nuts which are within in it and on top of it. Very nice! This recipe creates delicious truffles that melt in your mouth! It's versatile too! You can give it a new flavour and texture by rolling the truffles in cocoa or desiccated coconut or chopped nuts. Rena experimented with the original recipe, which wasn't vegan and kindly shared the goodies with a few of us! There's three different layers to this slice. That's why I liked the fact that they were cut into small pieces! When I had another slice, to explore the layers again, I didn't feel so greedy! So do vegans have to miss out when it comes to dessert? I think it's so easy to cater for a vegan diet now. I wouldn't hesitate to host an event, which included a plant-based starter, main and dessert. From past experience, it hasn't been difficult.